Jeff Horn takes some punishment from sparring partner Ray Robinson. AS world boxing champ Jeff Horn was recovering on Thursday from a serious car accident he gained an unlikely friend in Anthony Mundine ahead of his world title war against American Terence Crawford in Las Vegas. "Jeff's a great guy, great for the sport,'' Mundine said. "I really admire the way he carries himself and his trainer Glenn Rushton has done a terrific job in developing him into a world champ. I give them all my love and respect. Mundine, the former WBA super-middleweight champion, is angling to fight Horn in a huge Suncorp Stadium extravaganza late in the year regardless of the result against Crawford in Las Vegas on June 10. But he is offering Brisbane's world welterweight champ tips on how to fight the slick American. "Jeff gets hit a few times, but he's tough, unconventional and awkward. He has to make it a real brawl like he did when he beat Manny Pacquiao and he has to disguise his attacks. He can't come in square on. 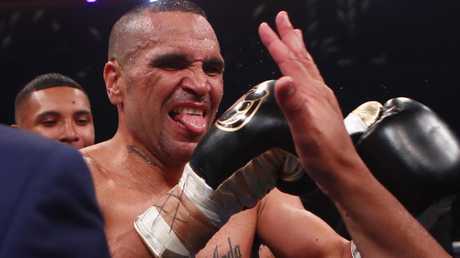 He has to feint with his feet a lot to keep Crawford off balance and guessing,'' said Mundine. Horn said he was still fighting fit despite being involved in a serious three-car accident at Rocklea in Brisbane's south on Wednesday that required an ambulance on the scene. 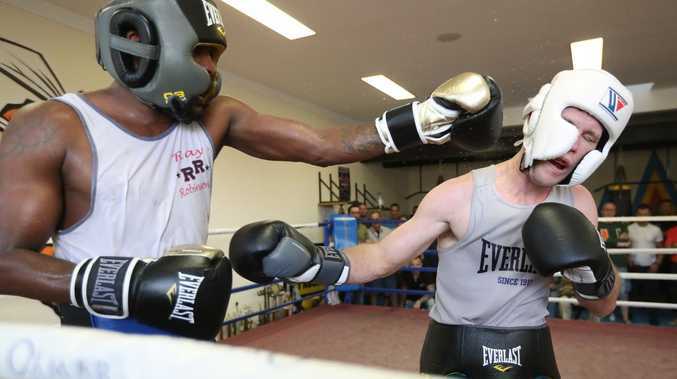 Perhaps the accident still affected him as Horn slugged away in the later rounds of his gruelling 12-round sparring session on Thursday at Stretton. He went through 10 furious rounds with American southpaw Ray Robinson and two with unbeaten Brisbane prospect Mick Whitehead. In the closing rounds Robinson capitalised on some Horn carelessness, landing several hard shots including two big right uppercuts. Horn insisted, though, that he was coming into peak form for the big fight in two weeks. Mundine hopes to face Horn at the end of the year at Suncorp Stadium regardless of the outcome on June 10 and his team have made approaches to the Horn camp already. Anthony Mundine wants to fight Jeff Horn before the end of the year. Mundine's win over Danny Green in 2006 is still the biggest pay-per-view event in Australian history. "I think Jeff Horn-Mundine could top even that,'' Mundine said.